So it's that time of year again, and Electronic Arts has graced us with yet another stuff pack for The Sims 3. Is it worth your money, and do you really need more stuff in your game? 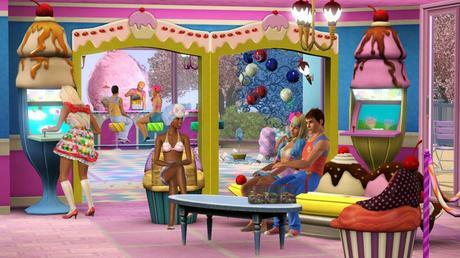 Katy Perry Sweet Treats is the 6th stuff pack in the Sims 3 series, and the second game endorsed by Katy Perry. Sweet Treats sugerfies your game with new candy-and-sweet-themed usable objects, build-mode objects, lots, and outfits (22 outfits for women, 1 for men....so you see where this is going). Everything is essentially the same stuff you already have and only 39 usable objects are added to the game (only 4 of which are interactive). Many people will probably find the outfits to be the most appealing considering they remind me of the scene in Not Another Teen Movie when the main character walks out with whipped cream covering his chest and *ahem* other parts. Overall, the game adds a lot of wasteful stuff covered in Katy Perry's endorsement, and many of the items look like custom content downloaded from a 3rd rate creator on The Exchange. *I wasn't kidding about those outfits. Three new lots are added in Sweet Treats, although I didn't find them attractive enough to keep placed in my town. They are loud, obxnious, and stand out among everything else. I can't imagine many players would want their towns and houses to look like Wonka Land. After the short-lived novelty wears off, you can visit Patty's Natural Baths, Bonbon Lawn Park, and The Cake Pleasure Dome for some more explosions of diabetes in your face. You can also listen to the simlish version of Katy Perry's "Last Friday Night T.G.I.F." and REALLY feel that $30 price tag. Final Thoughts If any of you are Sims 3 fans, I suggest staying away from this expansion pack. Not only does is beg the question "Why wasn't all this included in the previously endorsed Showtime expansion pack, also featuring Katy Perry? ", but is also screams shameless contract deals with it's $30 price tag (all other stuff packs have been $20, with more and better additional content). If you like Katy Perry, have at it. Otherwise, keep your $30 and go watch Willy Wonka and the Chocolate Factory.